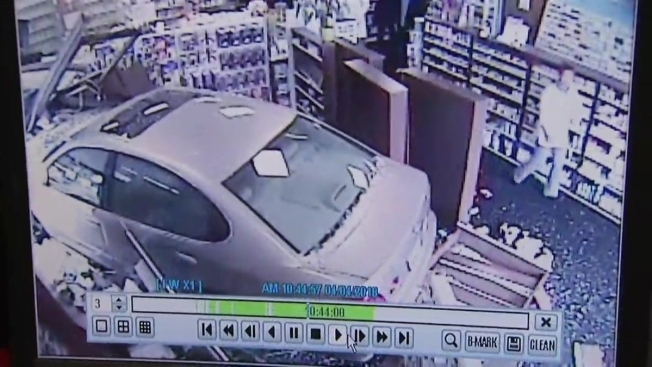 Miraculously, no one was hurt when a car crashed into a Maryland pharmacy late Wednesday morning, sending medication flying throughout the store. Two customers were standing just inside the door to Express Pharmacy on Frederick Road near Ridgemont Avenue in Rockville when a woman pulled a Lexus up to the building and then hit the gas instead of the brake and crashed through the front door. Surveillance video shows the car veered to the left, avoiding the customers, who jumped to the right. The driver then tried to back out of the pharmacy, startling a pedestrian in front of the store, who jumped out of the way. No one inside the pharmacy was injured, and the driver declined to be taken to a hospital, according to Montgomery County Fire and Rescue. A building inspector was called to assess the safety of the building.